There are two types of media junkies. 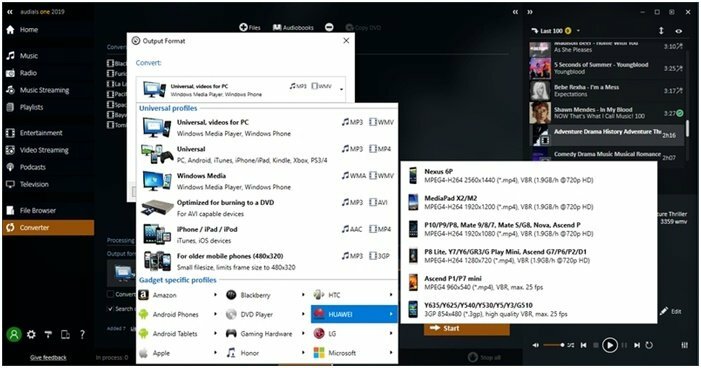 One, those who can manage all their media using folders and directory navigation. Two, those who need a professional tool for storing, managing and accessing your music, movies, podcasts, TV series etc. If you think you are in the second group, Audials One 2019 is something you must check out. 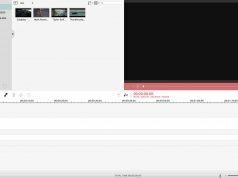 As the name says, Audials One 2019 is the latest version of Audials One, a popular media recorder, management tool and player for Windows PCs. Personally speaking, we’ve used the previous versions and were really impressed by their quality and options. So, when we knew Audials is launching a newer version, we were more than excited to review Audials One 2019. 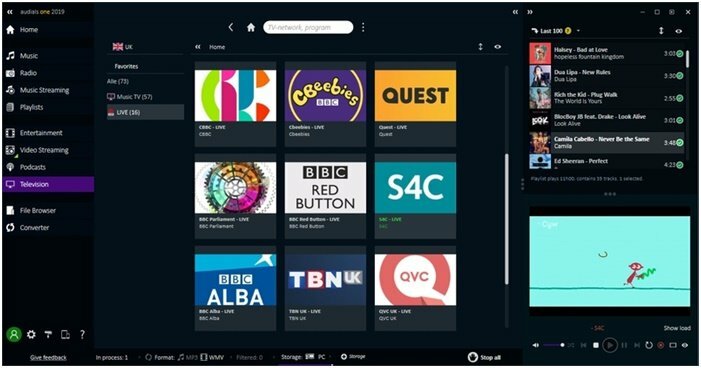 To get the basic ideas right, Audials One 2019 is the complete solution for finding, accessing, keeping and managing different kinds of media content from the Internet. Be it music, movies, podcasts or the latest season of the Netflix series, Audials One 2019 will help you deal with everything. Diversity is what makes Audials One 2019 one of the best tools out there you know. 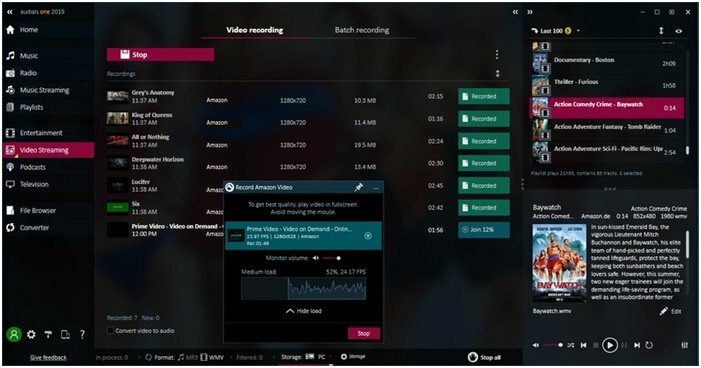 Using this single program, you can manage existing music, download/record music content from the Internet and even save streamable content from services like Netflix and Hulu. Making things even better, the latest version is packed with some cool features, such as a revamped User Interface, Easy downloads and records from web and the brand-new Music Bot for better suggestions. Now that you have the basic idea, we’ll check out the other notable aspects of Audials One 2019. It’s impractical to cover all the features or capabilities of Audials One 2019. Instead, we will have an overview of what you can do with this amazing piece of software tech. Good to go? Audials One 2019 lets you find, download, record and manage your music collection. You can download your favorite songs from various sources, including YouTube, Spotify, SoundCloud, Amazon etc. It has 5x speeds for recording music from Spotify — probably the only tool to offer the same. But, if you ask us, the best feature of Audials One 2019 is Music Bot. This will suggest a personalized music playlist, based on your favorite musicians. We also loved the option to complete the music collection via MP3 tags and other data from the Internet. It also shows you the best and popular songs right now so that you can download/record them. Movies and TV Series is another section where Audials One 2019 can be of great help. 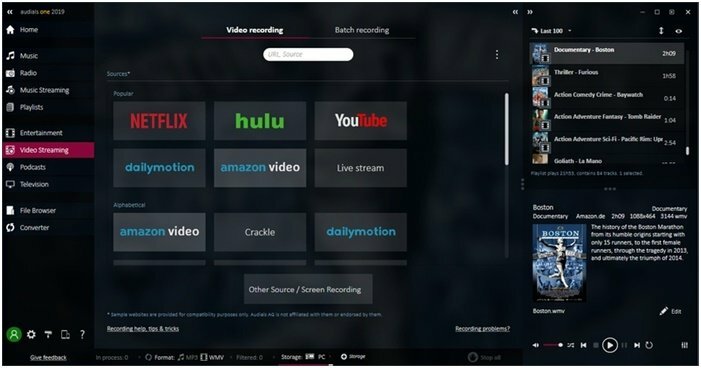 This tool is optimized for not only streaming but also saving content from popular networks like Netflix, Hulu, HBO Go and a plenty of other websites. 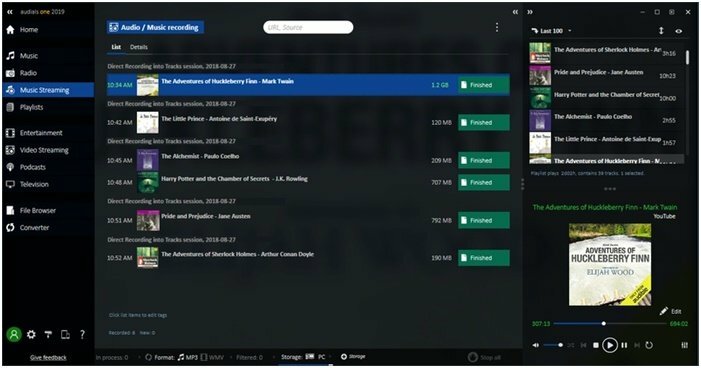 You can even record the file when you’re watching a favorite episode or a full movie. The simple UI will let you do these in a matter of seconds, which is great. Last but not least, you can even use Audials One 2019 to record TV series back to back. Once recorded, all these content can be saved in the highest-possible quality as well. Audials One 2019 has a bunch of options for managing your existing media content as well. For instance, you can convert existing audio and video files to compatible formats out there. This would happen seamlessly, without eating up much system resources. 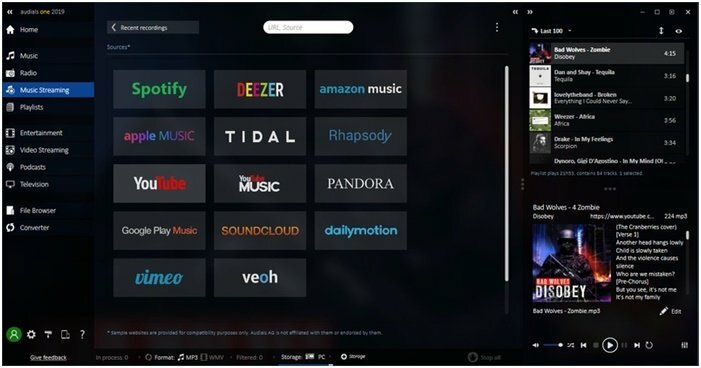 You are also getting an awesome music, video, TV and podcast player and management tool. Using the simple interface, you can enrich your existing music collection and add more tracks to it. 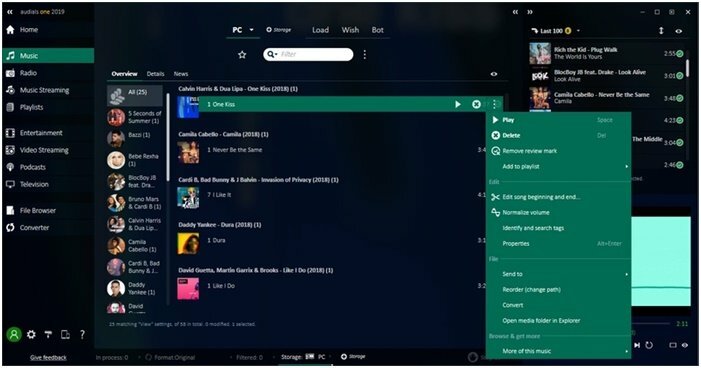 If you are a bit old-school, you can even burn CDs and DVDs using Audials One 2019. Audials One 2019 comes with device pre-sets, which will help you export things quickly. Altogether, it’s the complete companion for media management. An intuitive UI is something that makes Audials One 2019 usable for everyone. When it comes to the latest version, Audials One UI has improved a lot. 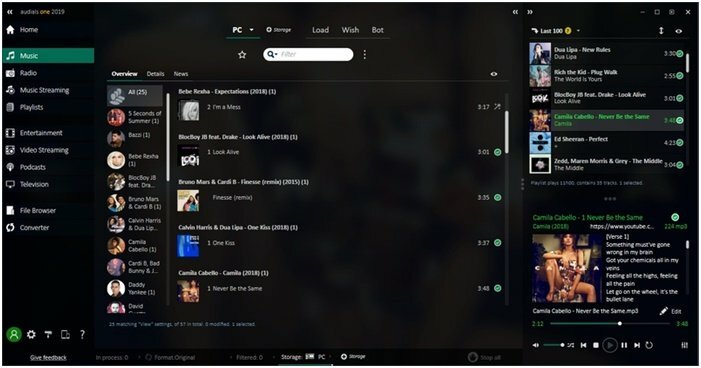 For instance, the Music section is now so unified that you can find, download, record and even manage music from the single window. There are also improvements when it comes to YouTube video downloads and easy music finding. It’s a UI worth recommending to everyone. 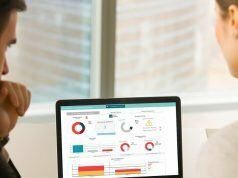 We have tried a number of media management tools in the past, but Audials One 2019 is exceptional due to many reasons. The best part is that you don’t have to worry about the geeky stuff. Everything has been well-optimized and the tool doesn’t even put weight on the processor. Even if you are completely new to finding and recording music, you can use Audials One 2019 like a piece of cake. 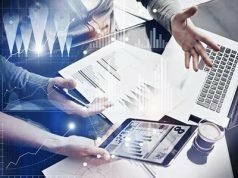 Considering all the points covered above, Audials One 2019 is one of the best tools for media junkies there! From a simply professional interface to well-optimized download/recording engines, Audials One 2019 gets things right — every single time. 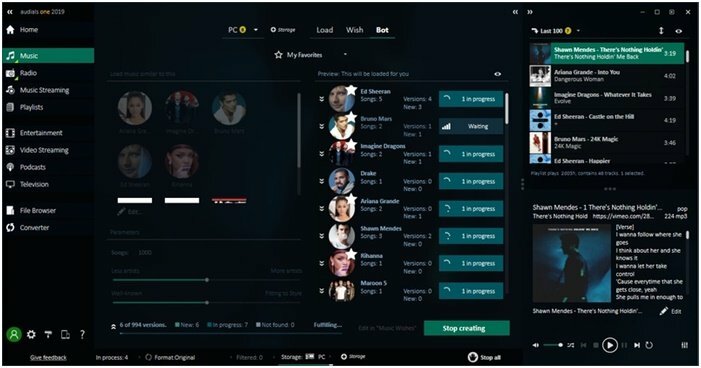 And, be it recording a song from an Internet radio channel or binge-watching your favorite Netflix series, Audials One 2019 would be an awesome option for everyone out there.